As anyone who grew up watching the capers of Mickey Mouse, Donald Duck and their animated ilk will tell you, Disney used to be in the business of crafting classic cartoon fare, producing countless full-length beauties like Snow White, Aladdin and The Lion King along with their shorter offerings. These days the monolithic corporation is perhaps equally interested in churning out star vehicles like Hannah Montana and High School Musical, in which young stars spend a few years pottering about their own TV shows before releasing an album or two, making the transition into films and subsequently cashing in on cross-promotion and merchandising tie-ins. Everybody gets rich, and the fans get another fresh-faced and impossibly attractive pinup to pine for. It’s a simple, win-win formula and a trend that shows no signs of abating. Disney’s latest choice of cash cow is Selena Gomez, a raven-haired stunner of Mexican, Italian and English heritage. The now 18 year old Gomez is an excellent choice of lead; she’s beautiful but relatable, effortlessly exudes charisma and if Wizards of Waverley Place is anything to go by is destined for every bit the level of stardom attained by Disney stablemates like Miley Cyrus and Vanessa Hudgens. She has the patter down too, casually dropping the names of Disney classics into interviews and having thus far enjoyed a scandal-free rise to notoriety that can’t help but make her the darling of Middle America. Disney executives must love her, and her countryfolk show every sign of following suit. Wizards revolves around the Russo clan, a working class wizarding family who run a sandwich shop. Alex (Gomez) and her brothers Max and Justin are instructed in the finer points of sorcery by their father. When they reach adulthood the trio will undergo a wizarding tournament, the victor of which will keep their powers and be the family magician of their generation, with the other two siblings becoming as mortal as the rest of us. Though clearly inspired by Harry Potter, Waverley Place is a markedly more sanitised and tween-friendly affair. This is Disney we’re talking about, after all. Despite their magical abilities the characters have no trouble fitting in to regular society, seemingly never experience any conflict relating to their ‘otherness’ and are, to all intents and purposes, an average hardworking family who simply like to wave their wands about in their downtime. Curiously enough the series also fails to take into account any back story of how the Russo’s came to attain their powers. The first episode opens with the three siblings being given a wizarding lesson by their father, offering plenty of jokes but absolutely nothing by way of exposition. The storylines are also a bit on the fluffy side, but given the target demographic that’s probably to be expected. 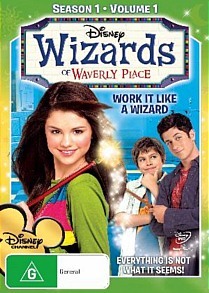 Minor quibbles aside, Wizards of Waverley Place is certainly not the worst pre-teen fare out there. The cliques and cattiness of junior high provide plenty of humorous fodder, and Gomez and her two young co-stars prove more than capable of giving the series its comic momentum, playing well off one another in the process. Volume 1 of the first season contains the first seven episodes, and while extra incentives are all but lacking the show is nonetheless an enjoyable, lighthearted and colourful offering.